Rick in Bellingham Bay Rough Water Race. Back in 2006, nearing retirement, I needed a project and a way to get some keep-fit exercise. I found both with the Merry Wherry and the FrontRower. I have a history of bumping into things whilst going backwards (mostly in cars, but also rowboats), so I was very happy to discover a front-facing rowing rig that is well made and very efficient. Getting the leg power and upper body power is the key. Comfortable seating, back support and better hand position, self-feathering oars are all big improvements over traditional sliding seat outrigger rigs. Living on a small lake with a one-mile shoreline, its the perfect venue for my daily before-breakfast 40 minute/ 3 mile work-out. In the past 9-1/2 years I've covered 5300 miles in my little yellow boat. The Merry Wherry is 15 feet long, a stitch-and-glue kit, and weighs about 55 pounds. 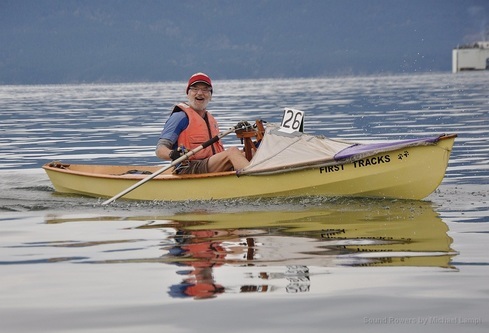 In the past couple of years I have competed in several races put on by a Seattle-based oar and paddle club that allows all designs of human-powered vessel. I don't have any dreams about beating the kids with their Surf-skis, High-performance Kayaks etc. and Olympic shells, but if there's a senior who shows up with any boat in my class - look out! Here's a photo taken during the Bellingham Bay Rough Water Race, last Saturday (March 12, 2016). Peter in his Odyssey 16.5. For several years I had been rowing a 600 pound 4-man lifeboat. It was super stable but oh so SLOW! After researching faster boats online that I could build, I became intrigued with the FrontRower. I did a demo row with Ron and was hooked. In rowing facing forward, I felt like a blind man who could finally see! What a different world after looking behind my whole life rowing. I ordered the Odyssey 16.5’ kit and built it during the winter of 2011-12. The kit was easy to build, the instruction book clear, and the resulting boat incredible! I have logged 531 miles on my FrontRower so far. Had I not developed a rare cancer and needed a stem cell transplant, I would have had a lot more hours on the boat. While recovering, all I could think about was getting back out on the water. It was great therapy. It is amazing what a good row does for one's mental and physical health. Besides being a piece of art, the FrontRower mechanism is robust, it has performed flawlessly since day one. I highly recommend the FrontRower and can’t wait for the weather to warm up a bit more so I can get out rowing again! 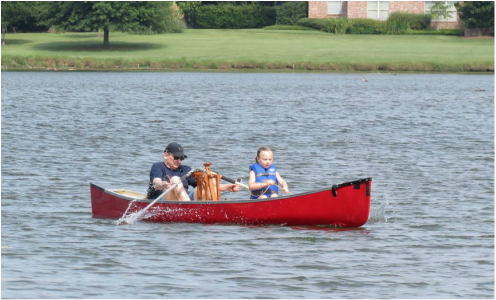 I usually paddle a canoe but have always liked the idea of getting a row boat. A friend of mine told me about the front rower site on the Internet and as soon as I watched the video I knew it was exactly what I was looking for. The best thing about it is that I am now retired and it is something that I can do alone whenever I want. I also love fishing and it is great to be able to have your hands free and still be able to troll. I have two different canoes that I use it in depending on the weather. I like it so much that I just talked a friend of mine into getting one. It was a great retirement present to myself. ​I first saw the FrontRower at the Wooden Boat Show and fell in love with the design of the 18 foot Odyssey and the concept of facing forward while rowing. I sent for the plans. I built a 24 inch version of the Odyssey from heavy paper and placed it on the television stand, set just below the TV to remind me that I needed to order the kit for the full-size boat. I mentioned to Ron Rantilla that I had built the boat from paper. He sent me a balsa scale model kit. I put the balsa kit together and promised myself that I would find time to build the full size boat. Finally I found the time. And it did not take much time. Over a series of weekends starting in June 2011 I put an 18 foot Odyssey together. It was beautiful, or rather it is beautiful. And for a first time boat building project it was perfect. By Halloween of 2011 it looked so good that I knew that I could not paint it and do it justice. So I took the boat to a professional painter. He returned it to me in January 2012. Since then it has been in a number of salt ponds in Rhode Island, on various parts of the Connecticut River, the Farmington River, in Mystic and Newport Harbors. One of my goals is to row the Connecticut shore from Stonington to the Greenwich over a series of weekends. The boat is a charm to row and draws complements wherever it goes. My only regret is I had not built the boat two years earlier. I first became interested in the FrontRower when I saw one in action at Nanaimo Harbour in British Columbia when in a marina. I spent a year researching the product since I had only seen one operating at a distance. I had been rowing an Aero rowing shell and loved the speed but was always nervous about hitting things and not being able to see forward. One day I almost injured myself when I was headed under a dock on Lake Washington. I could have had serious head and neck injury. 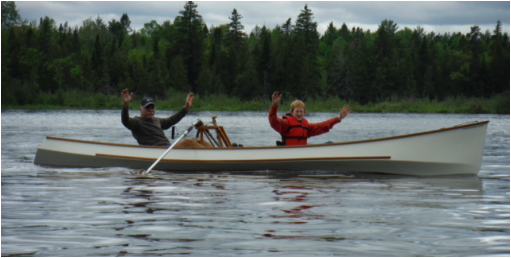 Growing older, I was willing to sacrifice some speed for comfort and got an Adirondack Guide Boat from Vermont, then put one of their conventional sliding seats in it. That is when I fell in love with the boat. After adding the FrontRower I really liked the boat even more. The FrontRower works very well unless there are high waves. I live on Lake Washington which can get very rough as it is about 25 miles long. Have come to realize that if it is too rough for the FrontRower it is just not a good day for rowing. Fortunately I can use it on most days. Initially I thought it would not be as maneuverable as my long regular oars, and also thought it would be slower. Neither is the case. Am happy I got it, and feel it is a good value for the added security it gives me facing forward. Be prepared for people to be curious and ask you about it. ​I am 73 years old and always looking for something new to do. I prefer outdoor exercise but I found that after many years of bike peddling and walking there was nothing new to see or do nearby. My FrontRower has changed all that! Every day on the water is different. If I want a workout I can comfortably cruise at over 3mph, (faster than my usual walking speed,) using long smooth strokes with the oars and pedals. If I want a scenic ride I go to the small quiet coves where the shore birds feed and get some photos. With the 2nd seat installed my Wife and enjoy a pleasant row to a nearby beach for a picnic or just go on a relaxing cruise. I mostly cruise Wickford Harbor off Narragansett Bay. If the weather permits I enjoy cruising along the shore of the bay exploring the shoreline and small coves, places where no powerboat or sailboat can go. I have taken several power boaters and sail boaters for rides. They are always impressed with the places we can go and the things we see. The FrontRower is a different experience. You are not busy 'operating' the boat, instead you are enjoying where you are. On the water, in contact with nature. I love my front rower that I have owned and used two or three times weekly each season for over 20 years. I bought the front rower because traditional sliding seat rowing hurt my back and did not provide an opportunity to see what I was approaching. As an avid bird watcher, being able to see my destination was important. I use the front rower in an Alden shell as my early morning exercise when the lake is quiet and I want a workout as well as a peaceful experience. I usually row five miles in about one hour and have found the exercise a welcome way to start my day. I bought a second rower for my wife and when her exercise went in a different direction, I sold it to a good friend who uses it in a solo canoe. After 20 years of hard use I have replaced several parts as one would expect, but I have been impressed with the quality of the workmanship and durability of the essential components. I paddle a canoe and a kayak regularly, but the front rower provides a much more athletic experience while still providing a peaceful platform to enjoy nature. I strongly endorse this product and have recommended it to friends and acquaintances numerous times. George with passenger in his Odyssey 18. Since receiving my 18 foot Odyssey and FrontRower, my satisfaction with it has increased after each day on the local waters. I'm fortunate to have the ocean only 15 minutes from home. But I also row on various rivers and lakes within a two hour drive. The Odyssey's high portability factor and low maintenance allow me to hit the water whenever and where ever I like. Rowing with Ron Rantilla's system and beautifully built boat is the best change I have made in my fitness programs. Each day's row is two or three hours of "a holiday break" from my daily demands. What I like best is there are no recovery issues using Ron's unique rowing system compared to my other fitness activities. I have to admit, I also enjoy the constant attention my rowboat brings at the beach, or even on the way to it. Other boaters and people always compliment the quality build and elegant looks of my Odyssey. My only complaint is being frequently asked "Did you build it yourself?". My answer to that is "No, but it has been worth every penny I spent buying it." I bought the front rower initially so that I could face forward, eliminating the neck aches I get from rowing the conventional sliding seat rig. I installed the front rower in my 18' tripper canoe, and it is now an able camping boat as well as a nice recreational trainer. I have plans to retrofit my wherry for the front rower too. Over several years of use, this rig has more than met my expectations for reliability, durability and function. I highly recommend it. Grandpa (William) rowing in Madison. My father William passed away unexpectedly in July. I wanted to let you know that my father absolutely loved the front rower. He used it every day on the lake in his backyard. I have attached a picture of my father using the front rower with his granddaughter Anna ( my daughter ). My father on the lake rowing his boat is something that we will all remember about him. My husband and I are Deaf, so we were interested in your product because we can row it forward and see where we are going. We felt it was safer, especially when there are other boats on the lake. We use the FrontRower in our White Wilderness Canoe. It provides good workout for us. My husband uses it a lot more than me. He has the additional time to do it; and he is much stronger to lift the system and the canoe. We do not have a place on the lake so we have to haul the canoe and the system. I like the system myself but I wish it was lighter so I could carry it myself. I know we will continue to use and enjoy the system for many more years. It is a nice way to enjoy the outdoor experience. I feel it is easy to learn and to use, once you get the hang of it. I first became aware of the Frontrower through a friend who, like me, is a life-long canoeist. We have both found it an efficient, elegant way to propel a canoe. I use it in a 15.5 ft fibreglass canoe designed for solo paddling. The option to use legs and/or hands provides a fuller workout than paddling alone. Be prepared to spend time answering questions from the curious on the water and at the dock. I use my FrontRower in a 17 foot canoe mostly on rivers and canals. Whilst I have no interest in speed for its own sake, the extra power that the FrontRower provides allows me to travel further and so see more interesting places. I'm also happy to venture out against a current or a strong wind where, if I were just paddling, I would have to give up. When I was travelling the length of the River Thames last year, I found the rowing position so comfortable that I was quite happy to spend ten or twelve hours rowing at a time. When it was time for lunch, I could quite happily keep rowing gently - just using my feet - whilst eating my sandwich. The design is just so brilliant and both the engineering and the craftsmanship are superb. Bravo Ron!!! I have been out on open water in a Force 4/5 (20 mph) wind with 2 - 3 foot waves and, although I wouldn't do this without other people around, I did feel quite safe bobbing up and down over the waves with my low centre of gravity and I didn't ship a drop of water. 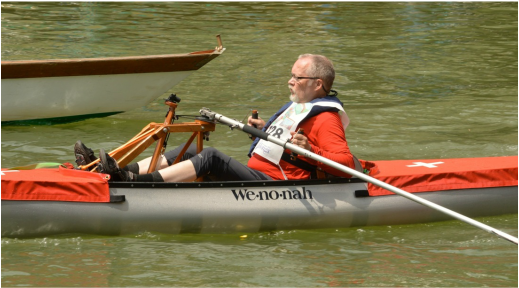 When on a river, if it gets too narrow to use the oars, it's no trouble to 'ship' the oars (they can easily be moved forward and right out of the way) and I can then use a canoe paddle - or even stand up and use a pole. I should aso mention that I am a musician and the wear and tear on my hands that I would get with conventional oars with blisters and being generally muscle-bound would be quite unacceptable. But, with the FrontRower, since the legs do a greater proportion of the work, my hands are not put under any great strain.